An Idle Mind... | is the devil's workshop. So, when you do this stuff I do (whatever is it, now they call it being a ‘maker’) you think you are alone in this part of the world: you can read what other people do on the internet, most in the USA and Australia, some in Europe… but they never seem to be here in Spain. You wish Scotty could beam you across the Atlantic, or, if not you, at least some parts you buy for your gadgets, without paying for shipment, customs and having to wait. 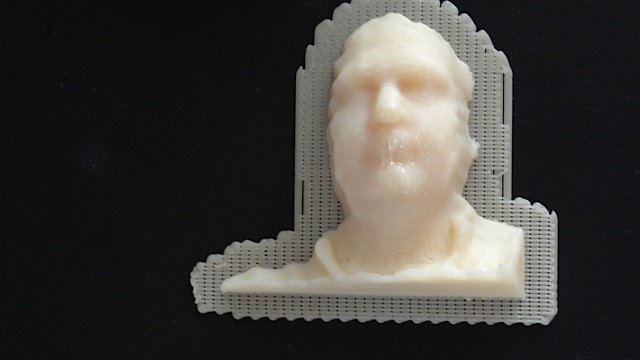 And then you come across an announcement for a Kinect + Makerbot workshop and suddenly, when you meet with about other 15 people with similar interests, you realize you are not as weird as you thought. But I will skip that for another day. Today I will focus on the contents of the workshop. 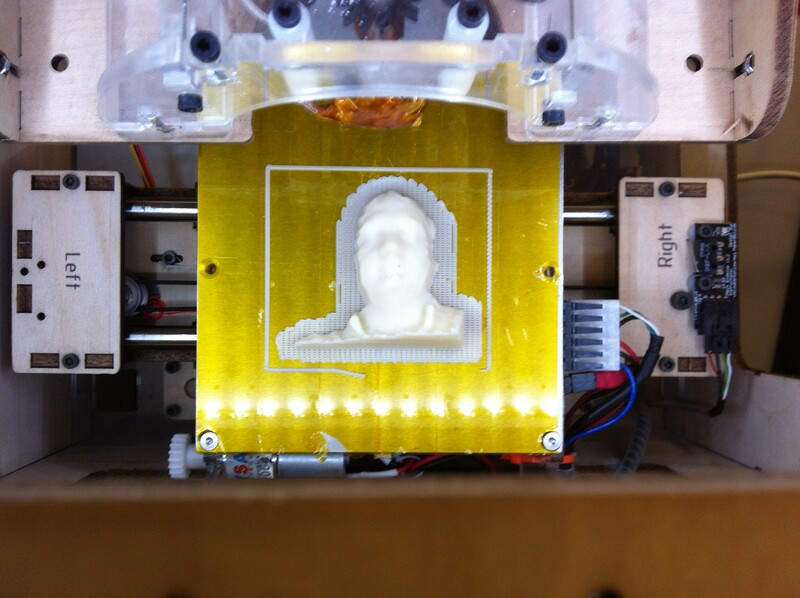 And see how all the Star Trek ‘Scotty beam me up!’ thing is coming alive. First setup the computer (OSX Lion in this case) to work with the Kinect, using the OpenKinect and OpenNI drivers and libraries. 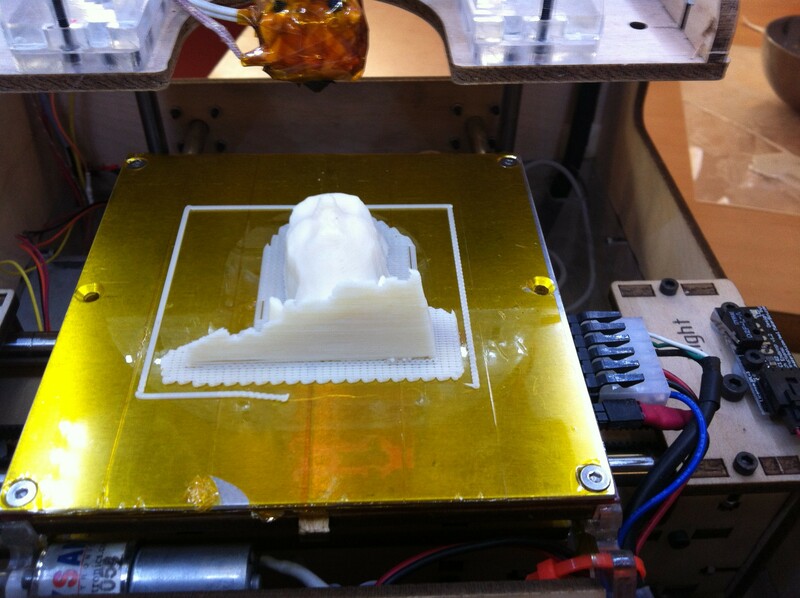 We used Processing and openFrameworks to run our examples. 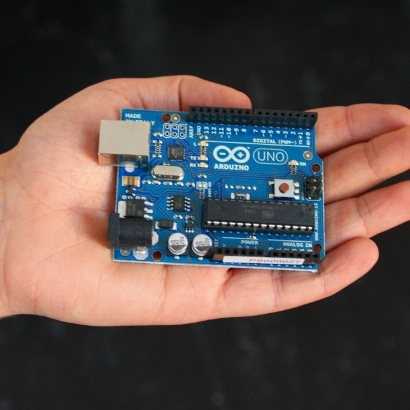 I had never used them, but they seem not to be too complex… In particular Processing should be very familiar to anyone using the Arduino IDE. 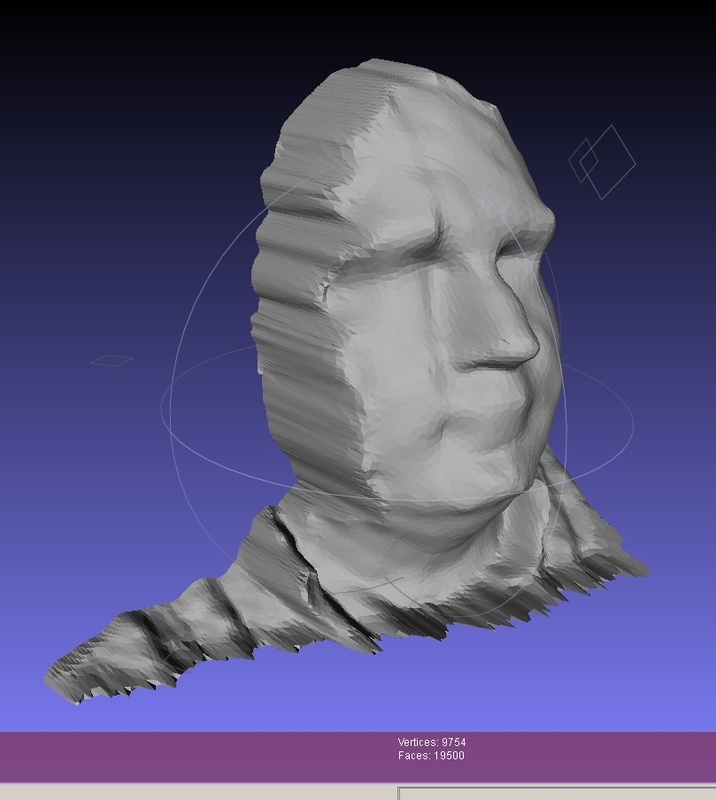 The 3D model was exported to Meshlab and Blender for face reduction and edge softening and final manipulation. In conclusion, no matter how many videos you may have seen of people doing great things with the Kinect, it really impresses how powerful it is, and how many tools you can find on the net to take advantage of it. The last one being the Reconstructme code, released just one day after the workshop. 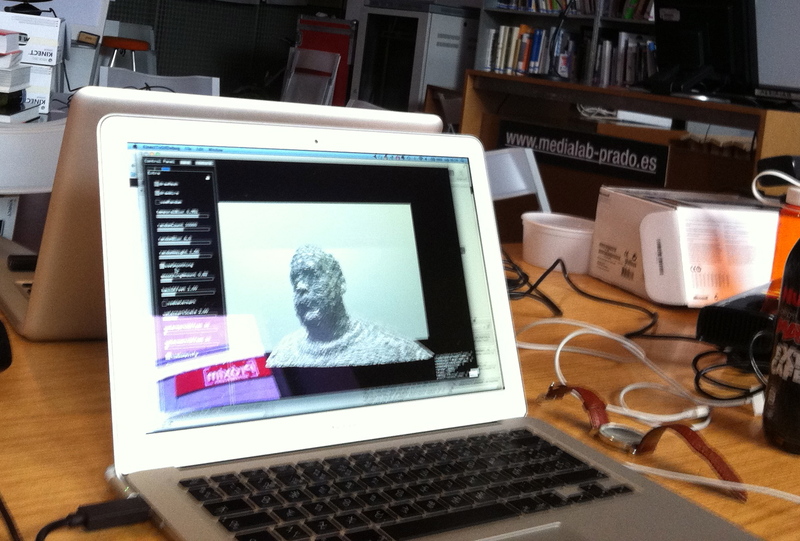 The workshop was held by the nice people at Medialab-Prado in Madrid. I had always dealt with the Medialab with some distance, since I did not seem to be able to make out what it really was. I knew it existed, but I was not sure what they did, and was a little scared of going in and ask… It definitely is not a fablab (yet) or a hackerspace. Along with the makers, there are artists, there, and it seems to me that it is more focused in art than I am. And then this workshop appeared, and it seemed to me like the perfect chance to go there. The workshop was hosted by organized by the Openfab group (this seems is a pretty self-explanatory name to me). 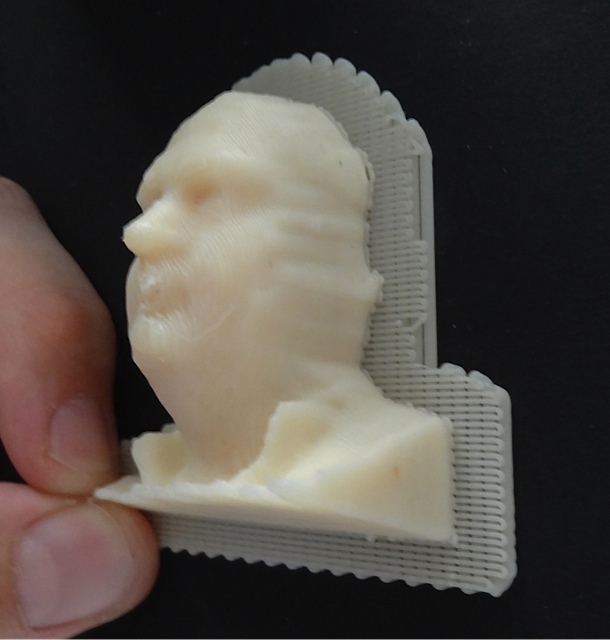 Our teachers and hosts were a mixture of artists, programmers and makers, namely: Chris Sugrue, Gorka Cortázar, Bernat Cuni and Dani, the Master of the Makerbot. In all, it was great to see how easy the open community has granted everyone access to the power the Kinect brings. Our trainers provided us with direct explanations on how to do everything, and were kind and responsive to our help requests. 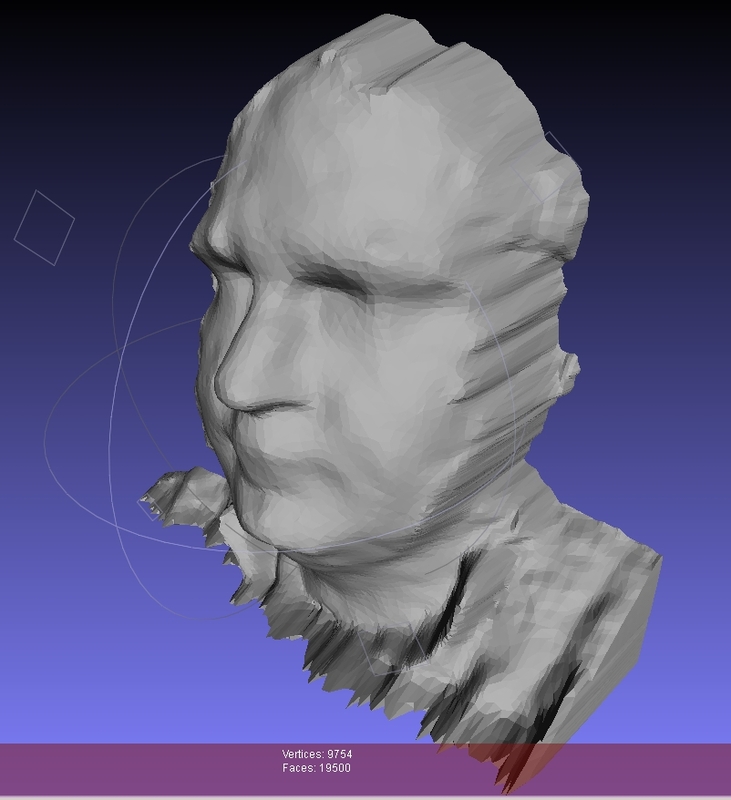 They also provided lots of links with detailed info and step-by-step instructions for setting up the libraries, managing the 3D models under free tools like Meshlab and Blender, and the printing them with the Makerbot. As you can see, all is invested with the ‘OpenX’ (open source, open hardware) in mind, which is a landmark of the Medialab philosophy. 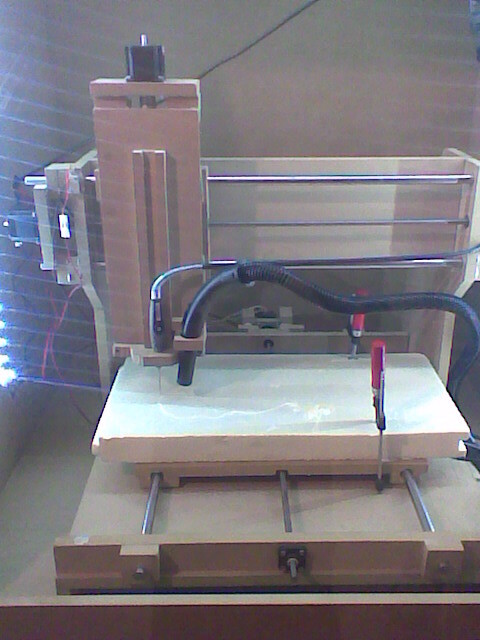 After this, I cannot wait for my Printrbot to arrive, and hopefully I will meet with the people at the Openfab group to build it and get to know more great people like those I met at the workshop. 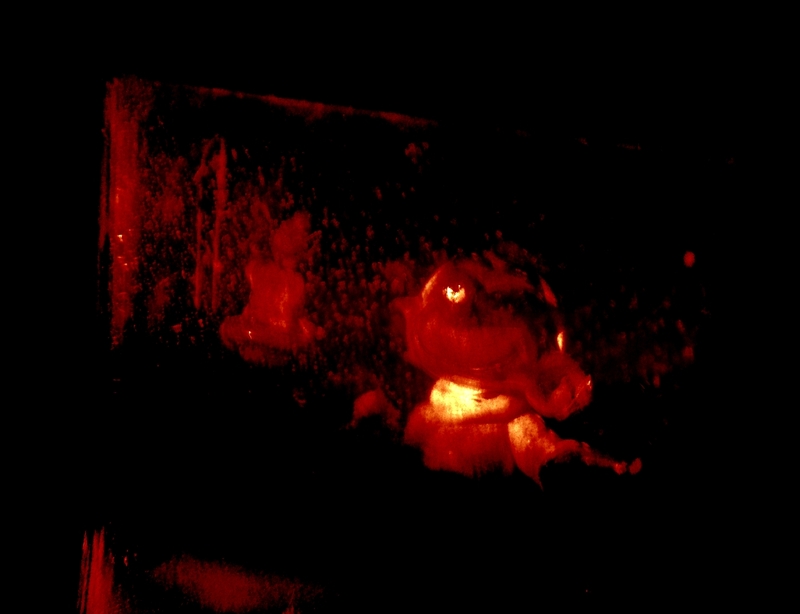 Smurf figurine reflection hologram on litiholo film. As Feynman says, this is another kind of poetry: the simplicity of the principles behind these, the details to make it work, and the esthetics, all come together. For details on the holograms, refer to this post. What all this summarizes into, is that, out of frustration, I decided to embrace the KISS principle and give the holokit a chance. Oh, my! 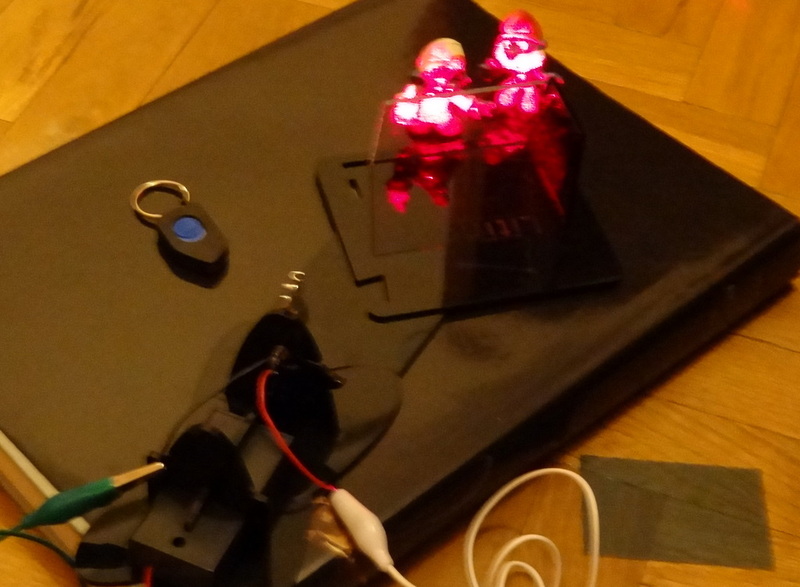 I will not delve into the contents of the kit, they are pretty clear in their site: a <5 mW led laser, some plastic pieces that snap together to create a simple single-beam bypass set-up for transmission holograms, and the plates. The special touch is in the plates (they call them “Instant hologram” film) that require no chemical, mechanical or heat processing at all. Just expose and that’s it. DISCLAIMER: The photos of the holograms are not great. Sorry, this is the best I and my friend Pablo could get. You know, holograms do not like to be photographed. They think (correctly) that photos steal their souls. BTW, thanks Pablo for some of the photos. We will keep trying and I will surely post better photos. 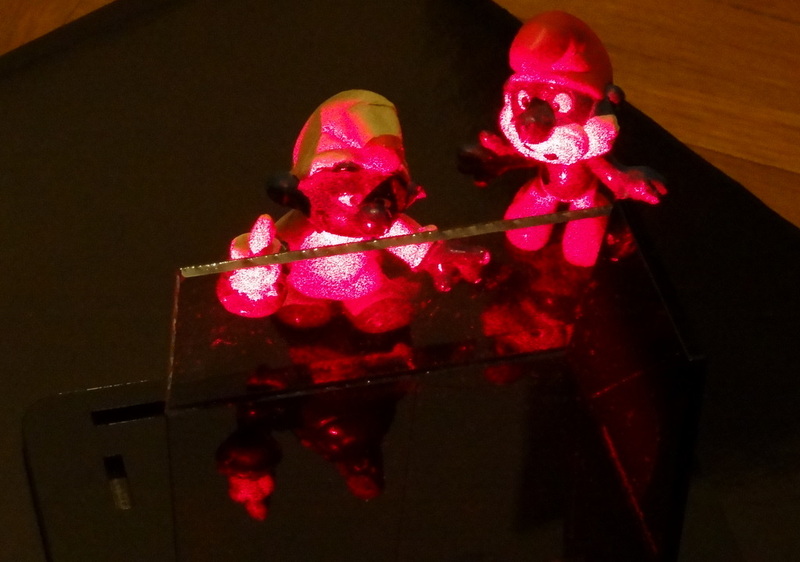 Some really important info before I go on: I made these holograms on the floor, no isolation table or the like. It is just the floor (wood covered) in a third floor apartment in a five floors building in a rather quite environment. First I tried the default set-up for a single-beam bypass transmission, with the red metal car provided, just following the instructions included. Since Litiholo claims that you cannot burn the film and that you should start at 5 minutes exposure and increase it if you did not get results, I decided I’d just go for a 15 minutes exposure on the first try. This is the hologram I got. Not perfect, but good enough for what I was getting so far with other approaches! Then I decided I wanted to try a single-beam reflection hologram, so I went to my toys drawer and got out a small smurf figurine. Yes, I know it is blue, this means little reflection in the red wavelength and longer exposition, but hey, what is life worth without some risk? I placed the figurine just behind the plate and exposed for 25 minutes. Et voilà! 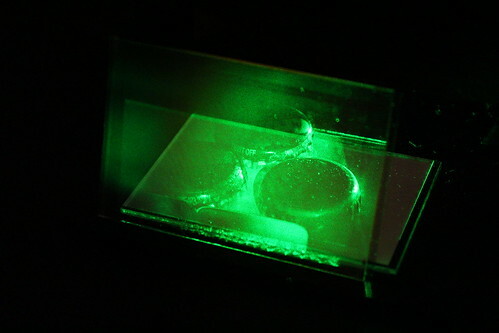 This first photo shows the hologram lit with the laser provided in the kit. 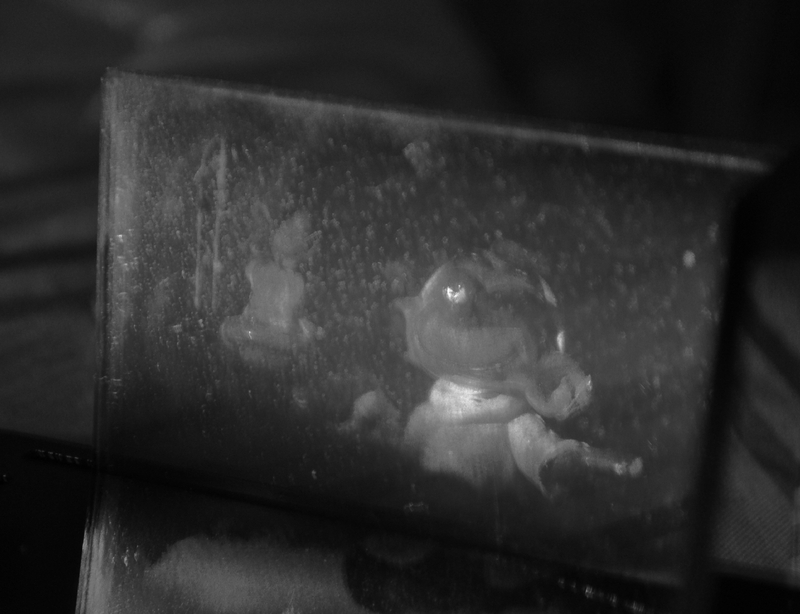 Though the photo does not show it, the hologram has great contrast and a second figurine (Papa smurf) is viewable on the back to the right. Again, notice that the figurine is blue in the face and hands, but it comes out pretty well. Two more versions of this photo, in black and white and enhanced contrast to help you see the subject better. 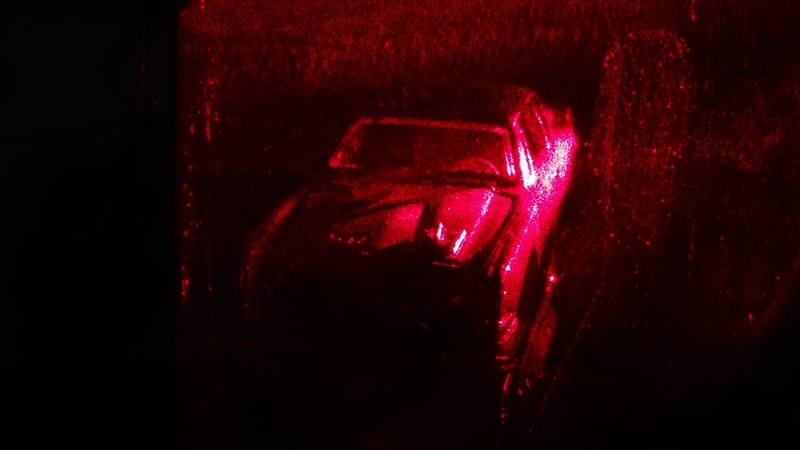 A final photo showing the hologram under white light. Some bad color dispersion in this one. I still have to try it out in the sun or with a nice spot light. You can also see a nasty blue streak on the top that looks to me like undesired movement during exposure. Let me add a quick note on the plate ‘components’: This last photo shows that there is a plastic film attached to the glass plate. 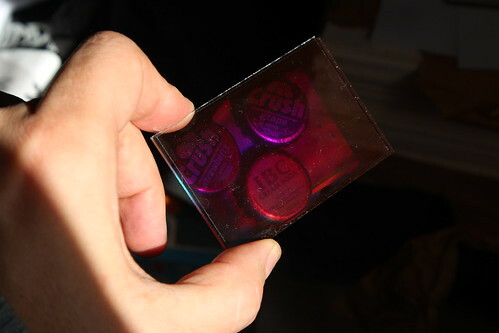 I asked Litiholo about this, and what we have here is a coated film (plastic) mounted on a glass, so that the ’emulsion’ is sandwiched between the plastic and the glass. So, when in the instructions they say ‘do not remove the plastic’, they mean it! Otherwise you’d be exposing a plain piece of glass (I did, I thought the plastic was a simple protection, not the actual film). On a more technical note, I miss some more information about the film properties. 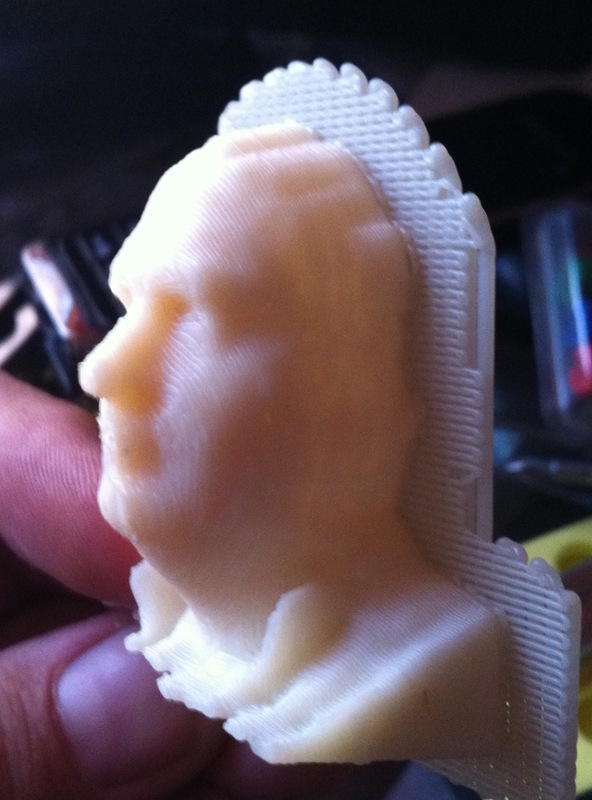 I can understand commercial reasons not to disclose much info, but… I need to try with other lasers. 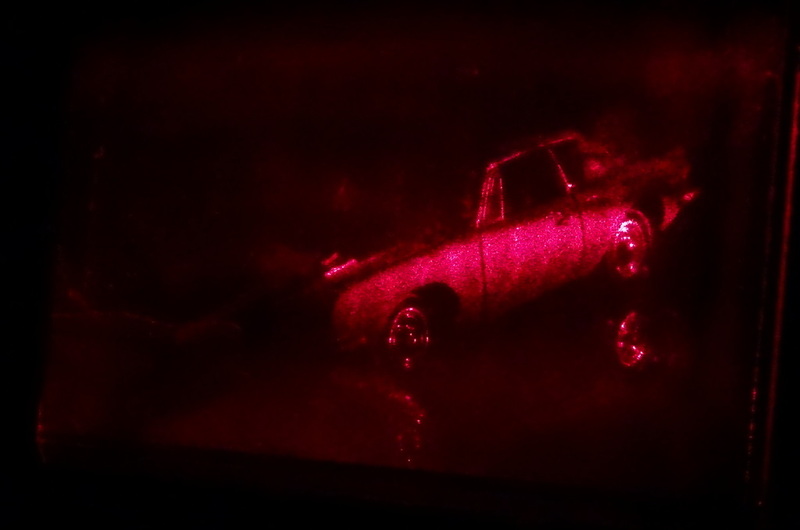 Also, someone at the holoforum mentioned that the film is actually panchromatic, but I have no confirmation on this. I got a fairly viewable transmission hologram at the very first try. I got a fairly viewable reflection hologram at the very first try. The film is rather tolerant with light around the set-up, I did not have total darkness in my tests, but some light coming in thorugh the door. 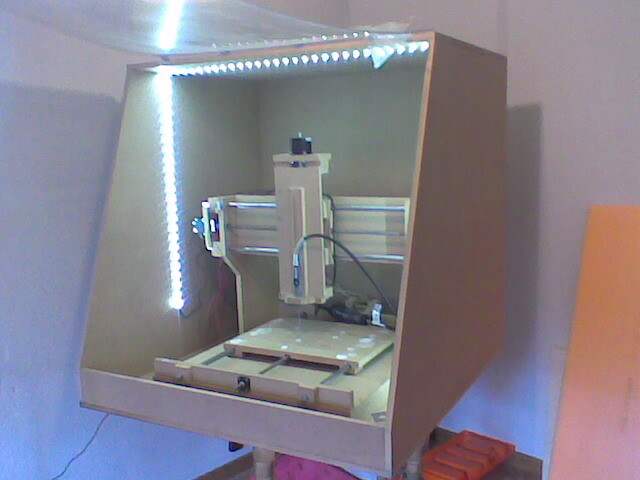 The kit only allows a single set-up (two if you know what a reflection hologram is). The lighting angle is not the best for replaying, an overhead lighting would be more natural. In conclusion, all my initial doubts were washed away as soon as my first hologram came out right! It seems a perfect set for classrooms and curious people, and the film offers lots of posibilities for people trying to go deeper into the matter like myself. 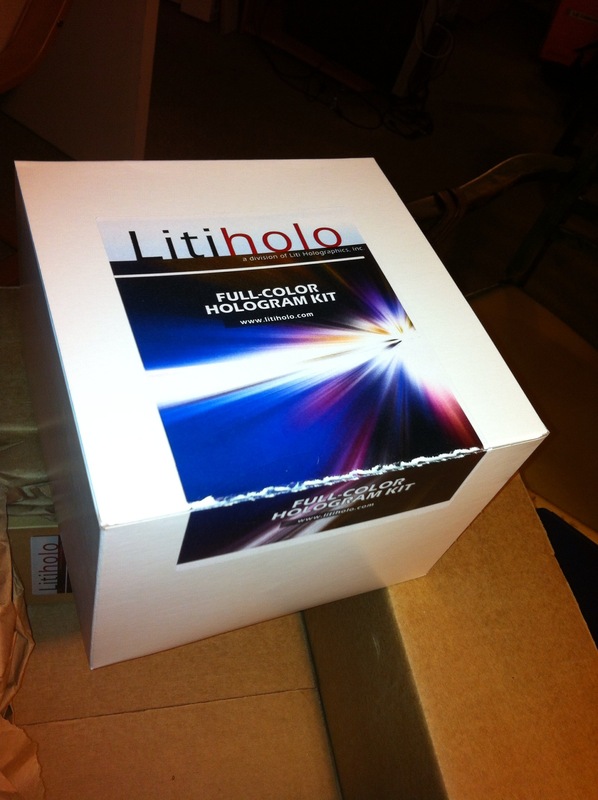 It has been a rewarding experience to try the litiholo kit, though it was so easy and simple that I even had a guilty feeling of having cheated. But I could not help but order some more film… which, by the way, I’d love to see in larger sizes. 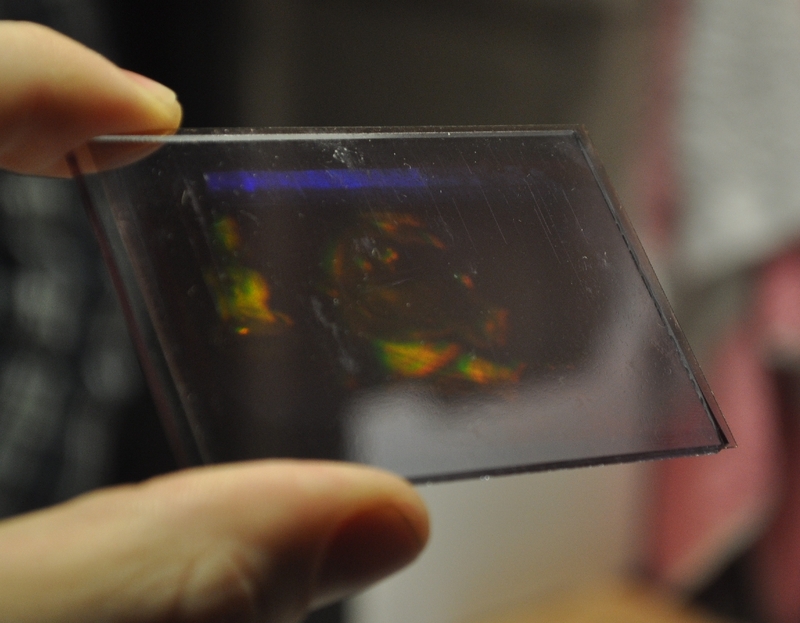 Regarding my own previous experience on holography, the use of the kit has shown me that I’ve been struggling with some very bad Slavich plates and thinking I was having more problems than those I really had. I always thought I had stability issues (which I have), problems with the chemistry (which I have), problems with exposition times (which I have) but never thought about the plates themselves. They could not be that bad. But the more I talked to people in the knowledge, the more I began to realize that the plates might be the problem. So I made different moves to address this issue, scouting for other films, one of which has been litiholo, but that is another story. So, actually removing the exposition time and processing times from the list of possible sources of error, and getting good holograms with these plates has helped me a lot to sort out where my problems came from. Will I keep using silver halide film? Definitely. Will I keep using litiholo film? Yes indeed. I have updated the link on the right of this page! Thanks again Ahmet.